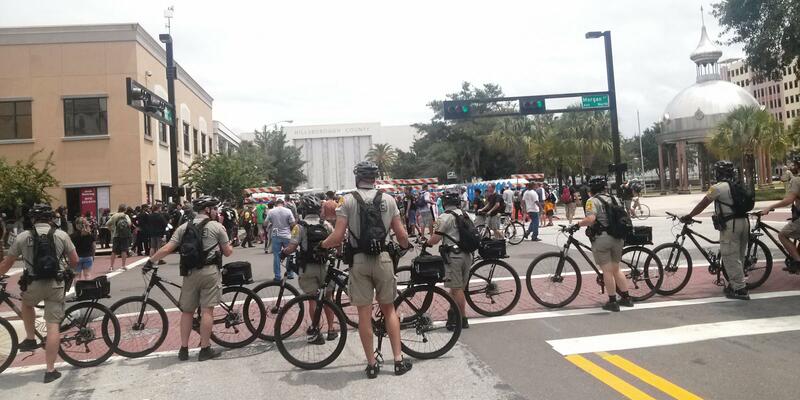 Law enforcement on bicycles surround a protest group near Tampa's old County Courthouse on Monday, August 27. Many times last week, Tampa Mayor Bob Buckhorn and Police Chief Jane Castor said they had a list of things they were sharing with their Charlotte counterparts -- things that went right and what they would have changed. Castor had a chance to meet with Charlotte-Mecklenburg Police Chief Rodney Monroe when he brought ten of his officers down to observe procedures in the early part of last week. Tampa Mayor Bob Buckhorn said his main advice to Charlotte’s organizers is to be willing to adapt and change plans quickly. "You have to recognize that and understand that this is very, very dynamic and to not get rattled when things happen that you didn’t anticipate," he said. He pointed to the way law enforcement handled protests in Tampa, particularly allowing spontaneous demonstrations to tie up intersections, but only for short periods of time. "And if you take a rigid approach to this, that’s when you’re going to have problems. But if you give these folks an opportunity to vent, to do their thing, but you enforce the law, it works out okay." One omnipresent sight for protestors in Tampa that they’re also seeing in Charlotte is fast-moving packs of law enforcement on bicycles. Chief Castor says this form of policing may become a fixture in the future, and not just in Tampa, as there were 200 bike officers from around Florida patrolling downtown. "All of those officers were trained and certified, and they’re taking all of that equipment back to their jurisdiction," she said. "So if you have a small city or a small county that can’t afford a bicycle unit, now they’re going to have those assets in their community as well." 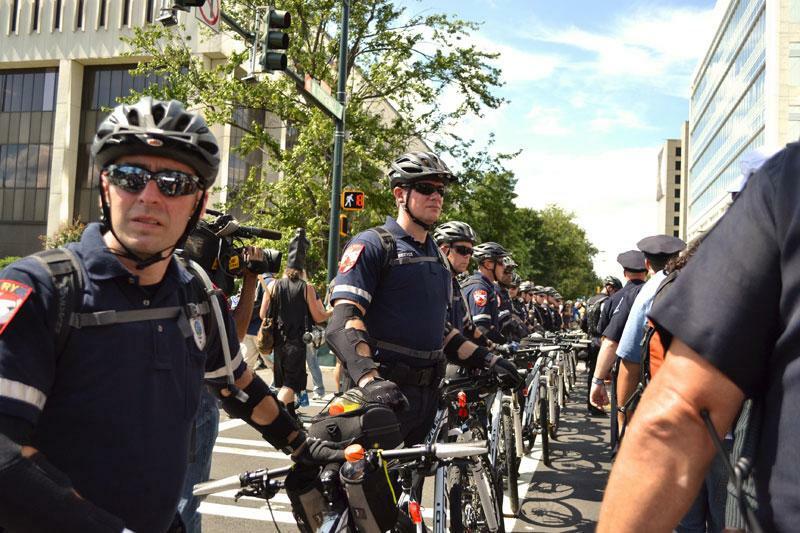 Charlotte-Mecklenburg Police reported two arrests at a Sunday rally that drew over 750 people. While that event was larger than any reported rally in Tampa, that's also the same number of arrests reported here all of last week. The Tampa Bay Times reports that Tampa International Airport officials faced a major challenge Saturday--not a huge number of people leaving town after the Republican National Convention, but fans of the boy band One Direction. It's been a rough week for my adopted hometown. First, it looked like our worst nightmare would come true: a direct hit from Hurricane Isaac with tens of thousands of visitors in town for the Republican National Convention. 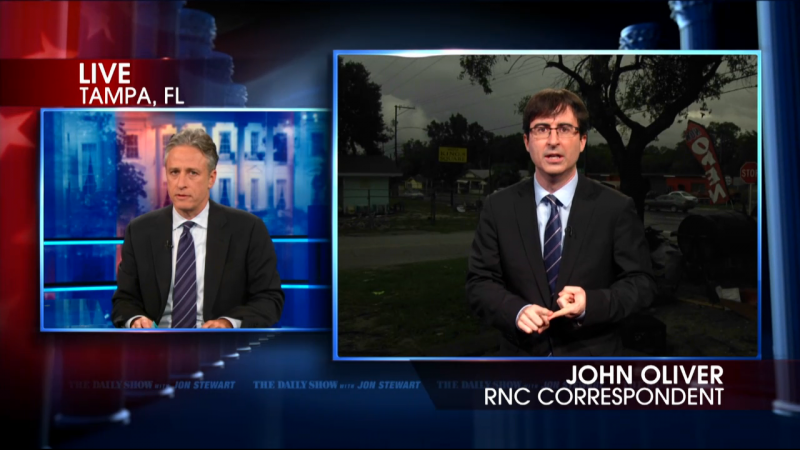 We were spared the worst of Isaac — but then came a raft of snarky stories about Tampa.